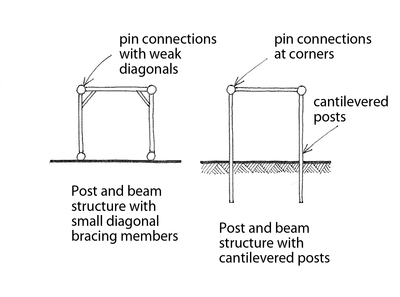 A framework of posts and beams where posts are spaced several meters apart. If the posts do not cantilever from the foundations, lateral stability may be supplemented by infill walls or by small diagonal bracing members (knee braces) at post and beam connections that provide some rigidity against horizontal forces. Includes systems comprised of cantilevered posts and trusses with simple pin-jointed connections between them. If most of the seismic resistance is provided by walls or infill walls then the lateral load-resisting system should be described as Wall. Note that posts and beams include vertically cantilevered posts or columns without rigidly connected beams that would otherwise transform this structural system into a moment frame. If these vertical members have a height to depth or length (measured in the direction they resist horizontal load) less than 3.0 they should be considered as Walls.